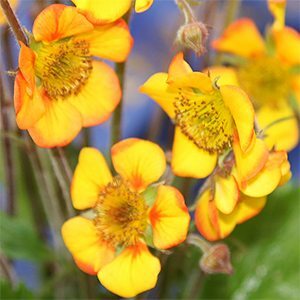 Geum plants (aven) are a perennial cottage garden plant related to potentilla, evergreen and widely spread from New Zealand to Europe with over 50 species. Geum coccineum are a fast growing plant that is usually easy to care for. Geum ‘ Pink frills’ and ‘Blazing sunset’ are popular cultivars as is the petty low growing cultivar ‘Jess’. Varieties and species such as Geum rivale are low growing and can be divided in early spring. Many species and cultivars are available for sale online as well as from garden centres. Red Robin – Best described as an acre to red flower. Tangerine – Brilliant orange flowers on an old cultivar we are lucky to still have available in Australia. Mrs Bradshaw – Orange to red flowers. Geum are a cottage garden or perennial border plant. They prefer full sun to part shade and they do not like frost. They grow well in a humus rich moist but well drained soil. Plants will spread to form a rounded clump around 50 -70 cm across. Dig in some well rotted compost and blood and bone before planting. Water in well with a liquid fertilizer, ‘worm castings tea’ or seaweed fertilizer seems to work well. A liitle mulch and perhaps a little slow release fertilizer in spring will aid growth and help keep moist. Water well during dry spells. Divide clumps during autumn. In terms of pruning, just a general shaping as required, Geums are a neat little plant. Best time to plant geums, early spring.